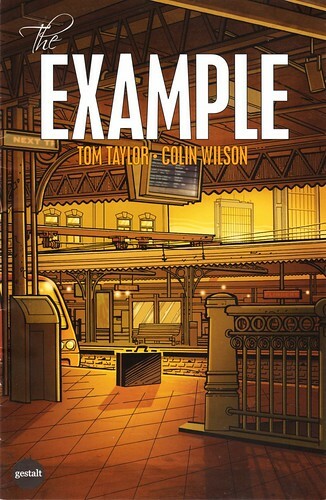 The Example, by Tom Taylor and Colin Wilson (published by Gestalt Books), might be the first graphic novel to be set entirely within the confines of Flinders Street Station. It’s a short but thought-provoking read, combining a most-of-Western-world issue — paranoia over terrorism — with a more decidedly local Melbourne issue: the trains. Speaking of terrorism and paranoia, the other book I’ve read recently is Zeitoun, by Dave Eggers, which was a terrific, if chilling, account of a man who stayed behind to help after Katrina, and got locked-up for it with no charge, no lawyer, no phone call. Can you buy it from the “Sticky” bookshop in Degraves St subway? It would be the perfect self-referential book then! I bought “Chuck Norris vs. Jesus” there. Dunno. I found it in Dymocks in Collins St.